This tour is designed for anyone who is looking for an adventure ride while touring with a local insider. You will have time for cultural exploration and personal discovery throughout your trip. 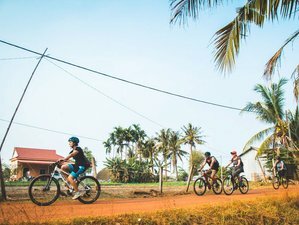 Through this cycling adventure, you will bike on a dirt road and jungle trails to discover the beautiful scenery and immerse yourself in the local Cambodian culture. Uncover the stories of the famous temples and learn about the ancient capital of Khmer Kingdom and local livelihoods. During the tour, you will be staying at the Central Corner D'Angkor for four nights. The property has an indoor pool, restaurant, and shared lounge, and Pub Street is a 9-minute walk away. This tour also takes you on narrow country lanes through the countryside to explore the local ways of life in Siem Reap. End the journey by heading down to the Great Lake (Tonle Sap) where you can experience the real activities of Cambodian people who live in the floating villages. Travel through time to the ancient temple of Angkor Wat by bicycle, enjoy a cycling adventure through the scenic land of Siem Reap and Angkor trails, and see the local traditions and culture of Khmer people. This quick but in-depth trip will give you great insight into real Cambodia. Travelling by bike will connect you closer to places and people where you get to smell and hear things that you would not experience from sitting on the bus. You will be met by your tour guide and driver at your arrival point. They will be holding a Siem Reaper name board with your name on it. It is possible you will be a little bleary-eyed after a long flight and there are also likely to be a large number of meeting boards being displayed, so please take your time to locate them. This tour is tailor-made to suit cyclists of all levels of experience, fitness, and all ages with different backgrounds. Siem Reaper require all of cyclists to enjoy the challenges but should respect everyone’s limits of cycling. The tours are designed so everyone can go at their own pace, and bear in mind that this is not a race. It is strongly recommended that you ride a mountain bike, and not any other types of bike since this cycling trip will be on asphalt, dirt, and back roads that some are sandy and rocky. However, Siem Reaper can provide mountain bike or road bike, as if you wish to do the tour with them on the well-surfaced roads. If you are much more comfortable with your own staffs, it is highly suggested bringing such as pedal, saddle, helmets, and water bottle. A mechanic will adjust to your bikes. Welcome to Siem Reap! Upon arrival at the airport in the morning, you will meet the driver and the English-speaking tour guide, who will be waiting to transfer you to your hotel to check in. You will have time to rest before starting your cycling at 02:00 p.m. In the afternoon, you will be taken down the interesting dirt roads to escape town and to experience local livelihoods. There are multiple scenic places where the tour will stop, including rice fields, rice mill, local market, mushroom farm, and more. During this ride, you will stop and be welcomed to try local fruits and snacks at the local village. You will return back to town and take a break from touring and enjoy the creative local cuisine at Marum Restaurant, a local NGO that has been working with street children and other marginalized young people. After having dinner, you will head to Phar Circus, where their shows tell stories of Cambodian history through a mix of music, dance and acrobats, in addition to meeting the talented performers. Dinner is included on this day, and accommodation will be in Siem Reap. After breakfast at the hotel, you will start biking the morning temple exploration at the most illustrious temple with fewer crowds. First, you will visit Ta Prohm which is unique in that it has been left largely as it was found: overgrown by jungle trees and vines, with many parts of the temple crumbling to the ground. This makes the so-called Tomb Raider Temple, as it was used during the filming of the movie, one of the most picturesque and memorable temples of the Angkor complex. You will then head out to the ancient city of Angkor Thom, enter the city through the ancient gate, an impressive stone gate carved with elephants and four giant faces. From here, you will continue to Bayon Temple, found in the center of the city famed as the enigmatic faces representing the 54 provinces of the Great Khmer Empire. The Terrace of the Elephants and the Terrace of the Leper King are also must-visits as they are both known for their intricate bas-reliefs. You will take a break at lunch and stop at the local restaurant to enjoy tasteful Cambodian dishes. Lastly, you will bike to the gem of the Angkor complex, Angkor Wat. Following your tour leader, you will be mesmerized by the rich history and symbolism of this unique ancient temple. Afterwards, you will return to your hotel. Breakfast, lunch, and dinner is included on this day. Accommodation will be in Siem Reap. You will depart from your hotel in the morning on the adventure ride through the scenic land all the way to Banteay Srei temple. Along the way, you will cycle past the local markets, schools, Buddhist temples, and the stylish Khmer wooden houses where you will gain more information about local ways of life in Siem Reap. Upon reaching Banteay Srei temple, you will begin to explore this incredible temple famed as the “Citadel of the Women,” which remains the best-preserved temple in Siem Reap. Afterwards, you will enjoy your lunch at the local restaurant before taking a short transfer to Kbal Spean. Then, you will trek uphill into the jungle trail for 3.5 kilometers to the waterfall and the River of Thousand Lingas. You can see the carvings on the river bed and waterfall before returning back to town in the evening. Breakfast and lunch are included on this day. Accommodation will be in Siem Reap. Today, discover the great landscape of the Tonle Sap lake by bike and boat. This is a unique experience offering a great outdoor adventure into Siem Reap’s countryside by exploring a floating village and enjoying a sunset cruise along the river. This morning, discover the wonders of Cambodian food by going to a village cooking class in Siem Reap. Prepare to visit local markets, village life, and landmarks while whipping up delicious dishes. Cook with a private chef in their countryside kitchen, whilst learning the cultural traditions of several small rural villages. After having lunch, your guide will take you to the airport. Please arrange your departure flights any time from 15:00 onwards in order to fit in with the itinerary departure. Breakfast and lunch are included on this day. Sokvuth has joined the Siem Reaper team to learn the trade of guiding. Through his hard work and skill, he is now one of our outstanding tour guides. He loves introducing people to new experiences, cultures and little-known places. He believes guiding offers him the opportunity to meet new people from all corners of the world and share his story with travellers. Siem Reaper’s tour leader and a cycling enthusiast. With his wealth of experience and passion, he sets up himself to share the wonders of his beautiful country and connect people from all over the world. He is an excellent tour guide as he has a desire to share stories of his country. Cycling and travelling are his passions. This cycling holiday will be held in Siem Reap, Cambodia. You will cover places including Phar Circus, Ta Prohm, Angkor Thom, Bayon Temple, Great Khmer Empire, Angkor complex, Banteay Srei temple, Kbal Spean, River of Thousand Lingas, and Tonle Sap. The cost of the packages includes five breakfasts, four lunches, and one dinner. It is recommended that you do not drink tap water during your trip. Bottled water is available at all times and is a safer option. Just like in many Asian countries, the staple food of the Cambodian diet is rice. Food usually serves with salted fish, chicken, beef, or pork. Fish is often fresh from the Great Lake, Tonle Sap, and is normally eaten with a spicy peanut sauce called “teuk trey”. The most popular Cambodian food is Amok, a soup of boneless fish with coconut and spices. In Siem Reap and Phnom Penh, Western food is widely available. If you wish to enjoy the western you can enjoy this option on your request. Let Siem Reaper know well in advance if you are a vegetarian or have other dietary requirements. It is not usually a problem for them to provide since the office operator takes note and pass it in advance to the restaurants or hotels where you will be served. Meals may not be as varied as you are used to and if you know there are plenty of food you cannot eat, you may wish to bring extra snacks from home so you can top up your energy supply. Please book your flight to arrive Siem Reap International Airport (REP). Transfers from and to the airport is included. Siem Reaper will pick you up from the airport. Siem Reaper designs and leads luxury trips in Cambodia's most amazing places. Offering cycling tours, food tours, family vacations.